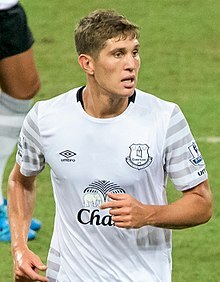 John Stones (born 28 Mey 1994) is an Inglis perfaisional fitbawer that plays for Premier League club Manchester City an the Inglis naitional team. ↑ "Squads for 2017/18 Premier League confirmed". Premier League. 1 September 2017. Retrieved 11 November 2017. ↑ "John Stones". ESPN FC. Retrieved 15 May 2018. ↑ "J. Stones: Summary". Soccerway. Perform Group. Retrieved 15 May 2018. This page wis last eeditit on 11 Julie 2018, at 05:42.